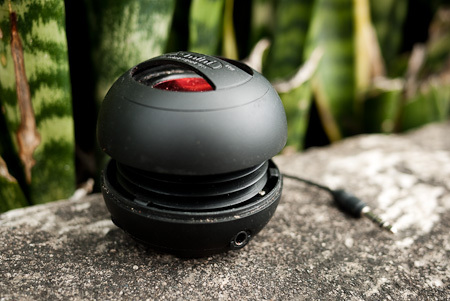 Body riddled with mosquito bites, I’m now back from jungle trekking in El Mirador, and preparing from some dirt road adventures in the Guatemalan Highlands – more on that soon… In the meantime, just a quick post to share news of this awesome little gadget. Purists like to travel without music. But if music is a big part of your life, it’s hard to leave it at home. A nice set of in-ear headphones are one thing, but to me, nothing beats my favourite tunes wafting across the camp site, or lending life to a dingy hotel room after a long day’s ride. Bike touring is all about going super light, and the X-mini 2 fits the bill perfectly. It’s little larger than a chicken egg, yet within its shell, manages to produce a surprisingly rich, bassy sound that’s a far cry from the tinny timbres of anything that’s a similar size. Proof is perhaps in the fact that it keeps disappearing – all those who has set eyes and ears upon it have asked to borrow it. The internal battery is good for up to 12 hours and charged via a USB port, ideal if you’re carrying a netbook. And, as netbook speakers tend to be underpowered, it’s great for watching movies too. Plus, it just about fits into the mesh sidepocket of an Orlieb bar bag, or in my top tube snack pack. I managed to get mine online via Amazon for just £12. 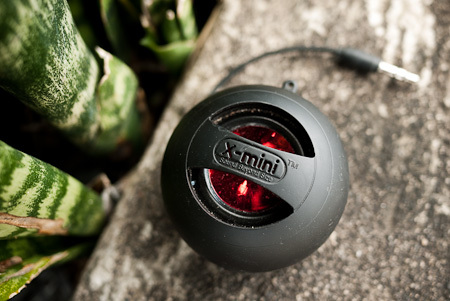 The X-mini 2 is a little bit bigger than a squash ball, and has a quality, well built feel to it. Reassuringly chunky, rather than light and plasticky. Neat. It concertinas out, making a noticeable difference to the bass, and allowing it to be protectedwhile in transit. The cable tail tucks away inside and if you have a second X-mini, you can piggy back them together. My miniature portable sound system. Speaker and MP3 player – the equally miniature Sandisc Sansa Clip, with 8GB of expandable memory. This entry was posted in Electronics and tagged portable speaker, X Mini on August 22, 2010 by Cass Gilbert. This is Michelle from Finca Ixobel. I just sent the letter about you to my editor friends, and I really hope you can strike an agreement about a story. Your story is incredible! I hope I’ll be here when you come back. Mario asked if I wanted to volunteer here today, and I’m thinking seriously of it. I gotta run, but I’m a faithful watcher of your site now. Good to hear that you are on the mend/mended ! 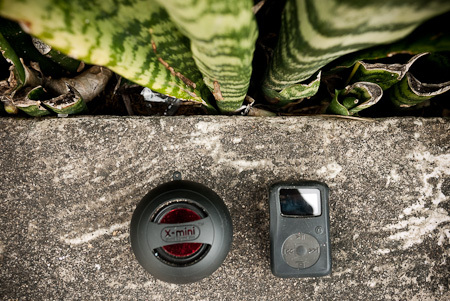 The x-mini looks like a nice bit of kit… whats the weight like ? As a matter of interest, if you push on from Guatemala now, what seasons are you hitting, and what is the weather like there now? Thanks Michelle, look forward to catching up at the finca. We might not be there for a bit, but if you end up volunteering, will surely see you then. Just been hanging out with the Brothers Volks, so I’m not quite the last! i want me one of those chicken egg speaker thingies. we now have bikes in london from boris the mayor dude – where you pick up a bike, swipe your card to pay for it, ride across town and deposit it at a spot of choice. cool eh. I picked up an xmini as well the sound is great. Bonus for looking like an alien head, and for making fast friends on a chicken bus. Your photos are stunning as always! Safe travels. I own a x-mini as well, mind boggling where all that sound comes from. As I was curious myself, it’s 84gr on my kitchen scales. For all you Apple fans, it doesn’t work well with Ipod’s and phones, as their output volume is to low. I have a little I-river player and together with the x-mini you can really have a party. Cas, I’ve been trying to find a name for the lightweight style of touring, cycling with frame bags etc which seems to be increasingly popular in the US. Have you come across a suitable name for this? Hey Stijn, how are you doing? I guess it’s known as Bikepacking. One of the main route/info websites seems to be bikepacking.net, run by the Scott Morris who also pretty much singlehandedly promotes the biking side of the Arizona Trail. It would be really helpful if you could do a post about how you keep all your electronics charged and any other gadgets you use to facilitate this. Do you carry all those chargers around? Gps, Airbook, iPhone, speakers, how do you do it? This review is over 2 years old now. Do you still have this particular little speaker and would you buy it again? We’re looking for something like this to take with us. Thanks! Completely. Mine is still going strong. I’ve recommended them to a bunch of people and it’s thumbs up all round. There are speaker systems with better sound, but they’re heavier, bigger and more expensive. If you’re after something very compact to plug into your iphone (no problem with volume output on mine) or tablet to watch a movie, it’s perfect. Off camping this weekend to the Carson National Forest with Tim and Jeremy. Can’t wait to get out! These days, I love my Outdoor Tech Buckshot. Very reasonable priced too, at $30. I’ll try the Greffen if I get the chance – thanks for the commment!